After surgery, your eye will not hurt. But it may feel scratchy, sticky, or uncomfortable. It may also water more than usual. Most people see better 1 to 3 days after surgery. But it could take 3 to 10 weeks to get the full benefits of surgery and to see as clearly as possible. Your doctor may send you home with a bandage, patch, or clear shield on your eye. This will keep you from rubbing your eye. Your doctor will also give you eyedrops to help your eye heal. Use them exactly as directed. You can read or watch TV right away, but things may look blurry. Most people are able to return to work or their normal routine in 1 to 3 days. After your eye heals, you may still need to wear glasses, especially for reading. You may have trouble judging distances for a few days. Move slowly, and be careful going up and down stairs and pouring hot liquids. Ask for help if you need it. Ask your doctor when it is okay to drive. Wear your eye bandage, patch, or shield for as long as your doctor recommends. You may only need to wear it when you sleep. You can shower or wash your hair the day after surgery. Keep water, soap, shampoo, hair spray, and shaving lotion out of your eye, especially for the first week. Do not rub or put pressure on your eye for at least 1 week. Do not wear eye makeup for 1 to 2 weeks. You may also want to avoid face cream or lotion. Do not get your hair coloured or permed for 10 days after surgery. Do not bend over or do any strenuous activities, such as biking, jogging, weight lifting, or aerobic exercise, for 2 weeks or until your doctor says it is okay. Avoid swimming, hot tubs, gardening, and dusting for 1 to 2 weeks. Wear sunglasses on bright days for at least 1 year after surgery. Tilt your head back, and pull your lower eyelid down with one finger. Close your eye for 30 to 60 seconds to let the drops or ointment move around. Do not touch the ointment or dropper tip to your eyelashes or any other surface. Follow your doctor's instructions for taking pain medicines. You have pus draining from your eye. Your eye is still red and bloodshot after 3 or 4 days. You notice new floaters, flashes of light, or changes in your field of vision. 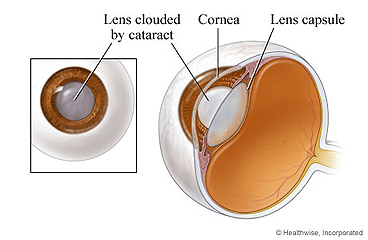 Enter R255 in the search box to learn more about "Cataract Surgery: What to Expect at Home".